Northern Velebit extends from the mountain pass Vratnik with the Senj – Otočac road to the mountain pass V. Alan with the Jablanac – Krasno road, and it is 30 kilometers long. A typical perception of Velebit as a simple ridge that divides the continental region of Lika from the sea like a wall of some kind is actually a wrong perception, especially in the northern part of Velebit, because this is in fact a spacious mountainous area with its width almost identical to its length at elevations of 1000 meters. In this peak area, we come across many peaks stunningly diverse in shapes and directions of spreading, with many randomly scattered dolines and karst fields all around. The northernmost part of Velebit is known as Senjsko bilo. This is the area extending southeast of the Senj – Vratnik – Otočac road to the Sv. Juraj – Oltari – Krasno road. Even though it belongs to Velebit, we can actually consider this area simply as the foothills of Velebit, due to relatively low elevations and modest morphology. This northernmost branch of Velebit has almost none of the typical characteristics of Velebit, and it has more in common with the southwestern part of Velika Kapela. Its central part is the main ridge 15 kilometers long, with the highest peaks Jadićeva plan (1416 m.a.s.l. ), Konačište (1404 m.a.s.l.) and Bijeli vrh (1492 m.a.s.l.). The slopes facing the region of Lika are very steep and covered in forest, with numerous terraces descending towards the sea on the other side of the mountain. One interesting fact about the area is that the vegetation of Senjska draga is a result of human labor: in the 19th century, this entire majestic valley was bare and rocky, so torrents flooded the city of Senj every couple of years. The most important mountaineering sites are the peak of Jadićeva plan and the locality of Sijasetska draga with a mountain hut. The most interesting hiking tour in the area is the longitudinal tour from Vratnik to Oltari – a section of Via Dinarica. Part of this trail follows the route of the Senj Hiking Tour, maintained by the mountaineers of Senj. 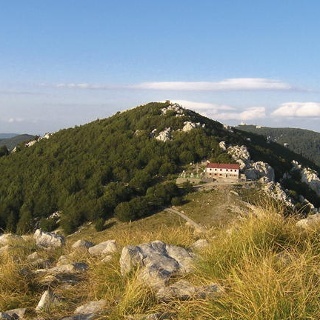 The starting point for the longitudinal tour along Senjsko bilo is the mountain pass Vratnik with the road Žuta Lokva – Senj. The trail starts above the motel, initially passing through the forest, and then, after only one kilometer, it reaches the road towards Stolac and Žukalj. Above Liskovac, to the right, there is a trail connecting from Sijasetska draga, and to the left there is trail branching from Žukalj and ascending to the peak of Jadićeva plan (one hour of climb). After the hamlet of Liskovac, the route continues with hiking trail markings that take hikers across meadows for one hour and a half to the hamlets of Tuževac and Rakita. One more hour of hiking remains to the village of Oltari with a mountain hut. Easy, well marked hiking through beautiful landscape. If Oltari hut is not open, might be able to pitch a tent in the ruin villages a couple of km before Oltari. I stayed at the hut, 84,5 kuna for the night, real toilets, running water and a great view over the sea.